Was it a dream? Yesterday evening you were at Turnberry. 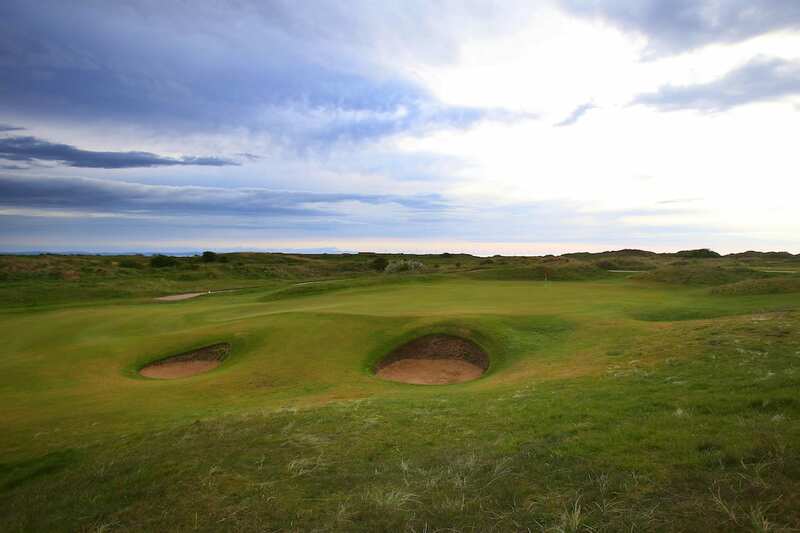 You play­ed the majestic Ailsa Course and then wined and dined in the Turnberry Hotel. Spellbound over dessert, you gazed in won­der as an orange and peach colored sun whis­pered “goodnight” to Ailsa Craig before slip­ping serenely into an indigo ocean. Well, maybe you did overdo the wine. This morning you are traveling from Ayrshire in Scotland to Lancashire in the northwest of England and are heading for Royal Lytham and St. Annes. The Isle of Arran backdrop, Bruce’s Castle and the famous lighthouse will be replaced by red brick suburbia, a railway line and Blackpool Tower, England’s answer to France’s Eiffel Tower. It’ll be fish and chips beside the pier tonight and, hopefully, the newspaper wrappings won’t get blown out to sea. So why are you heading for Royal Lytham and St. Annes? Perhaps it’s because it doesn’t bother you that the links is situated a full mile inland from the coast and that while you may get the occasional whiff of the Irish Sea, you will never see nor hear it. Indigo oceans? Poppycock! Golf, especially golf in the north of England, is not a beauty pageant. 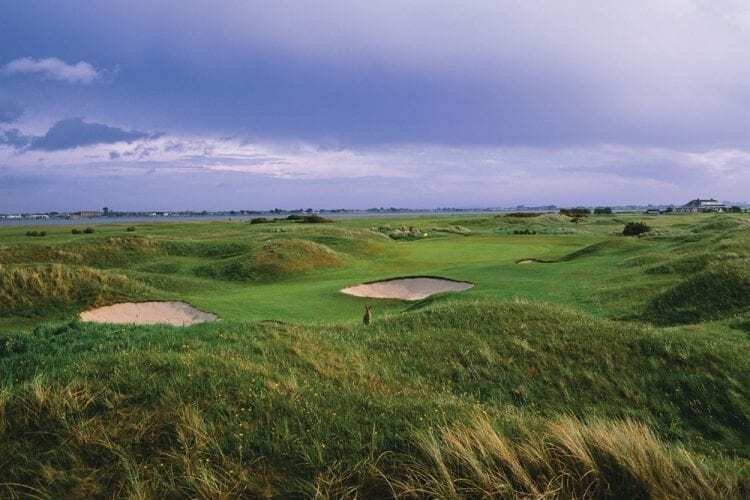 It is about challenge and character—and how many golf courses on earth can provide as great a challenge and exude as much character as Royal Lytham? Or perhaps you are on a pilgrimage. The Lancashire coast of England is a golfing mecca. With the likes of Royal Liverpool (Hoylake), Royal Birkdale, Southport & Ainsdale, Hillside and Formby all close at hand, the wealth of history and tradition in the area is almost tangible. To play Royal Lytham is to walk on hallowed ground. 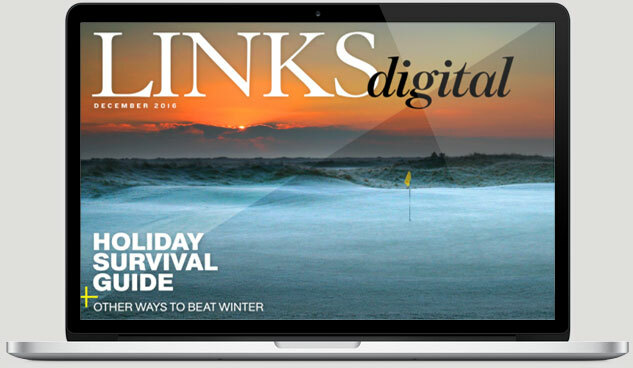 This is the links immortalized by Bobby Jones and twice conquered by Seve Ballesteros. It is not just Open Championship history, either, for since its foundation in 1886 the club has hosted the Ryder Cup, the Curtis Cup and numerous major amateur championships. But for the record, by the end of July this year, one British Open statistic will read: Royal Lytham and St. Annes 9, Turnberry 3. Spander was only partially correct: Lytham’s clubhouse can appear somewhat imposing from the outside, but Bram Stoker’s creation never set foot inside. 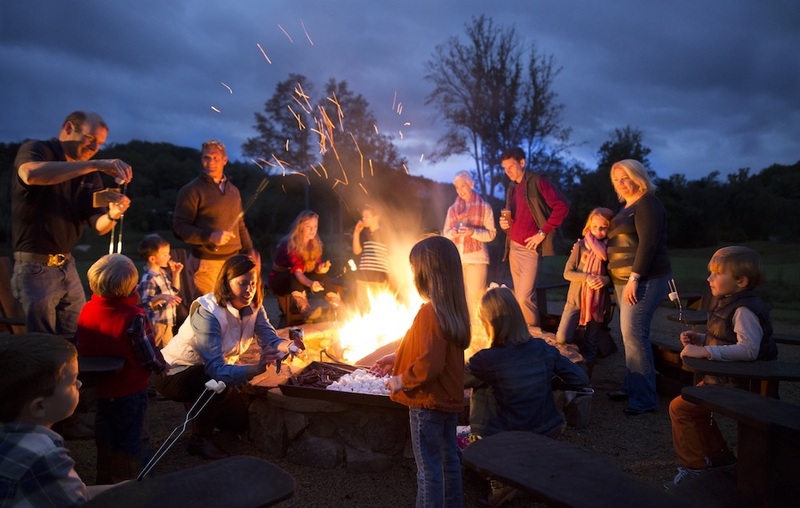 It is actually one of England’s more welcoming 19th holes. The atmosphere within is certainly more relaxed than at many “Royal” clubs. Players wishing to take advantage of renowned northern hospitality might wish to note the club’s adjacent Dormy House. Comfortable and convenient, it offers golfers the opportunity of waking up beside the first tee—and perhaps sneaking in some early morning practice. Nor should first-timers expect to be terrified by the prospect of the opening hole. Although expertly bunkered, the first at Lytham is a fairly straightforward hole. It is also a par-3, which is unique for an Open Championship venue, but by Lytham standards such an anomaly is par for the course—the entire layout has maverick tendencies. In addition to beginning with a short hole, the course contains successive par-5s on the front nine and, owing to greater yardage and the prevailing northwesterly wind, has a much tougher back nine. Frankly, Lytham is lopsided. It is the type of course on which a scratch player can scorch to the turn in 31 or 32, only to limp home in 40. The turf itself is excellent—true links terrain with firm, fast greens. Over the years various course architects, beginning with George Lowe Jr. and including such master craftsmen as Tom Simpson, Herbert Fowler and Harry Colt, have contributed to the design. Thus, in architectural terms, Lytham could be classed as a mongrel, even if it has an extremely fine (and “Royal”) pedigree. Anyone requiring proof as to the angle of the prevailing wind need only peer down the second and third fairways. The Preston to Blackpool railway line runs parallel to these holes all along their right-hand side and serves as a slicer’s grave­yard. Some willow trees have taken root amidst the rough on a thin strip of land between the fairway and the railway line, and these trees stoop and bow in deference to the wind. At Lytham the wind is always king. A fine sequence of holes begins at the sixth, the first of the back-to-back par-5s. Whether your preference is for the sixth or the seventh depends on whether you favor the Royal St. George’s (crumpled fairway—awkward stance) type of links hole or the Royal Birkdale (level fairway—even stance) approach. The St. George’s-like sixth has the more interesting collection of fairway bunkers to negotiate, while the seventh has the more attractively sited green, nestling in a bowl amid the dunes. The eighth pays homage to no links. It is a truly heroic hole, and though it may not be the most famous at Lytham, it surely rivals the 18th as the greatest hole. The view from the elevated tee is positively inspiring. Measuring 417 yards from the championship markers, it features some vast sandhills and a cavernous fairway bunker (visit here and a sand iron might just get you back out onto the fairway) to the left; the railway line and trees form a continuous boundary to the right, and straight ahead as you drive lie a trio of large cross bunkers set into a rise in the fairway some 60 yards short of the green. Their main function is to intimidate and deceive. As for the green, it is perched in crown-like fashion beyond an area of dead ground at the top of the hill. It is defended (surprise, surprise) by a pair of gaping pot bunkers. 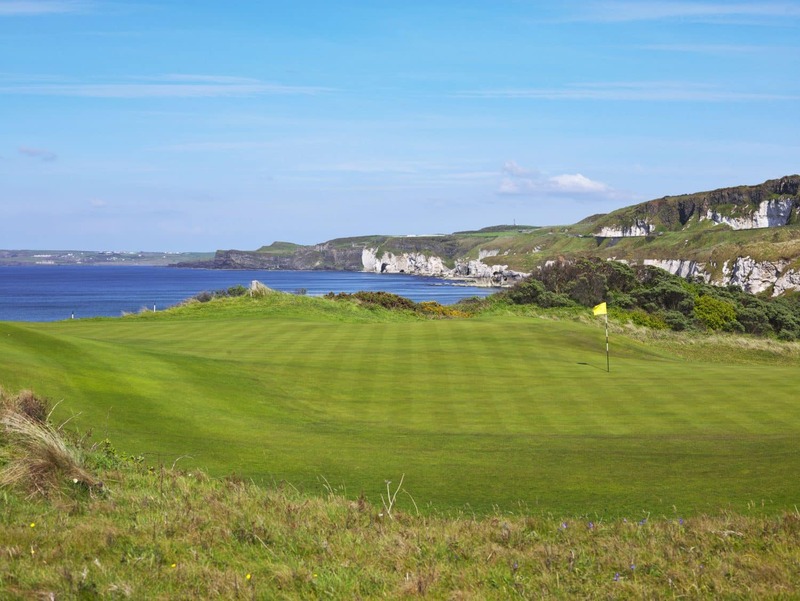 If you miss the putting surface and greenside bunkers the chances are you will be playing your next shot from deep gorse or from rough 30 feet below the level of the green. Heroic? Make that penal. But it is a marvelous hole. The 10th twists and tumbles and bristles with character but it is only a short par-4; the 11th, the “parkland” hole, has a difficult tee shot but is a par-5 nonetheless and although the next is a fairly long and fiendishly bunkered par-3, the 13th offers another birdie opportunity. It is now, with five holes to play, that Royal Lytham throws down the gauntlet. You stand on the 14th tee at Lytham, hoping your knuckles don’t turn white. For optimists it is the hour of reckoning; for pessimists, the wrecking hour. Champions, of course, rise to the challenge. In the second round of the 1979 British Open, Ballesteros played the fearsome finishing stretch in 4-under-par. In his final round that year he missed all but two fairways, including each of the last five (who can forget his car park escapade at the 16th? ), yet he still played the finishing holes in level par. The 14th, 15th and 17th are all prodigiously long par-4s. The 15th is possibly the most difficult of the trio: a slightly uphill drive paves the way for a long and semi-blind approach. The fairway undulates more than most and is strewn with a sea of seemingly magnetic pot bunkers. The Killing Fields of Lytham. History envelops the 17th and 18th. The former doglegs to the left and is almost as long and difficult as the 15th. It was on this hole that Bobby Jones effectively won the 1926 Open. Sharing the lead with his playing partner, Al Watrous, whose ball was lying safely on the green in two, Jones had hooked his tee shot wildly into an area of sand and scrub. He was 175 yards from the flag and faced a blind shot across a wilderness of dunes and rough. Jones selected his hickory shafted mashie iron and played the greatest shot of his life, his ball finishing on the green, inside Watrous’. The 18th owes its reputation as one of the world’s most celebrated finishing holes to some magnificent fairway and greenside bunkering. Like the 17th it has witnessed more than its fair share of drama. British commentators wax lyrical whenever they recall Tony Jacklin’s arrow-straight drive that split the final fairway and secured his triumph in 1969. Five years later, Gary Player, who almost lost his ball in the rough at the previous hole, was forced to putt left-handed from up against the clubhouse wall but still held on to win his third Championship. Ballesteros also claimed a hat trick of victories when he all but holed his pitch from behind the green to defeat Nick Price after a thrilling duel in 1988. And, of course, there were those remarkable scenes back in 1926. Jones’ outrageous stroke knocked the stuffing out of Watrous. “There goes a hundred thousand bucks,” he cried (according to legend) as he saw Jones’ shot reach the 71st green, whereupon Watrous three-putted against Jones’ par. Watrous also dropped a stroke at the last. Jones finished his round with two 4s, which left only one player with a chance of catching him. Walter Hagen—who else?—came to the 72nd hole needing to hole his second to tie. Hagen hit a good drive and after contemplating this do or die approach for several moments, sent his caddy forward to hold the flag. Suffice to say, he very nearly executed the day’s second miracle. Those were the days! And you can be fairly confident that Sir Walter didn’t dine on fish and chips that evening.